“It’s been just over a year since the passing of legendary recording artist Jimmy Castor. 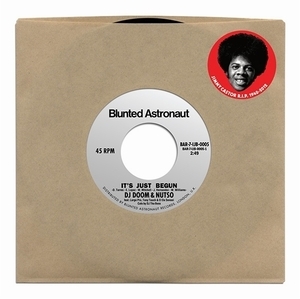 To mark this occasion, Blunted Astronaut and DJ Doom are proud to present a very special tribute to one of the most important B-Boy anthems of all time – the 1970 funk masterpiece “It’s Just Begun”. Hailing from Brooklyn, NYC, Doom has been immersed in Hip-Hop culture since the days of his youth in the early 1980’s. Graff writer, B-Boy, DJ, producer – there’s not a lot the man hasn’t done! On this, his third BA release, he teams up with Nutso for a truly unique project, revisiting a timeless classic that carries forward the musical legacy of the late, great, Jimmy Castor for years to come.